In the flash of a moment, your life can be turned upside down due to the carelessness of another driver. A prime example was a crash that happened on Gun Club Road at North Busch Drive in North Jacksonville, Florida. The Florida Highway Patrol indicates that the driver of a Chevy Malibu failed to stop at a stop sign and collided with a Dodge Journey carrying two people. One of the Journey’s occupants, a 49-year-old man, died from the collision. The other occupant, a woman, suffered catastrophic injuries and remains in critical condition, according to CBS 47 News. The crash caused the Malibu and the Journey to spin into a third vehicle, a Chevy Silverado. The driver of that vehicle also suffered injuries. Deepest sympathies go out to the victims of this terrible collision. Many lives were adversely affected as a result of this preventable car crash. The Florida Highway Patrol indicated that charges are pending against the driver of the Malibu who opted to drive through a stop sign. If you or a loved one was involved in a serious auto accident in Jacksonville, you need to speak to an experienced personal injury attorney to discuss your legal options. Hiring an attorney makes sense because they will pursue maximum compensation for your harms and losses. This is especially important if you suffered a life-altering injury or lost a loved one in an accident. Under Florida tort law, an injured party is allowed to pursue compensatory damages, which comes in two forms: (1) economic damages and (2) non-economic damages. Economic damages include itemizable costs associated with your injuries. For example, this includes medical expenses such as an ambulance bill, ER bills, rehabilitative care and lost wages due to time missed from work. Non-economic damages are meant to compensate you to for the intangible harms and losses associated with a major collision. For example, missing out on important family events and social functions do to your injuries, being unable to play with your kids or help your spouse around the house and other inconveniences. This is why non-economic damages are often referred to as “pain and suffering” damages. In certain circumstances, your Jacksonville personal injury lawyer may be able to pursue punitive damages. These are damages intended to punish the reckless driver if their actions were particularly egregious or malicious. Under Florida law, drivers are required to carry at least $10,000 in Personal Injury Protection (PIP) insurance. This form of insurance compensates you for up to 80 percent of your medical expenses and 60 percent of your lost wages without having to assess liability on one party or another. 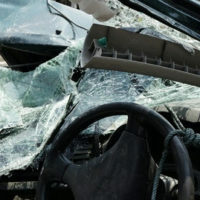 This may sound like a lot of money, but in serious car accident cases, it is woefully insufficient to properly compensate an injured driver or passenger. In some cases, the injured party may have well over $100,000 in medical expenses alone. This is where your own uninsured/underinsured motorist coverage can come into play and provide the necessary compensation for your harms and losses. If the reckless driver has minimal auto insurance coverage, you can seek additional compensation through your own auto insurance policy, depending on the amount of coverage you have. At Gillette Law, P.A., our Jacksonville legal team is here to help you get maximum compensation from the auto insurance company. To learn more about your legal options, contact our law firm today to schedule a free consultation.